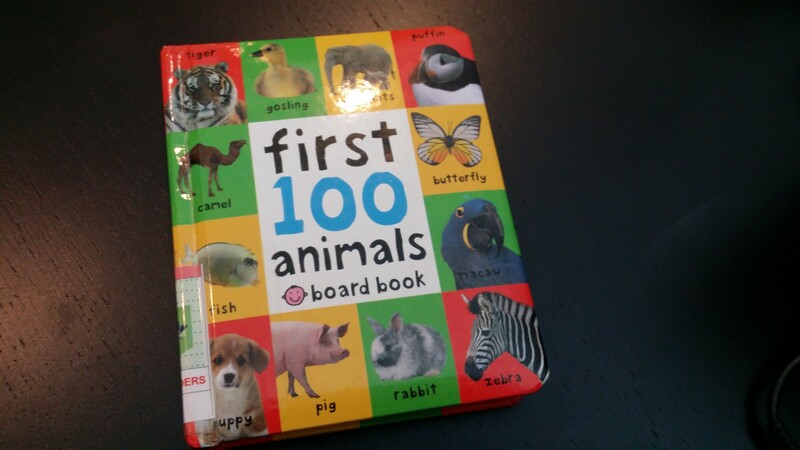 Riley has a little book with a lot of animals and their names in it. The giraffe is one of them. 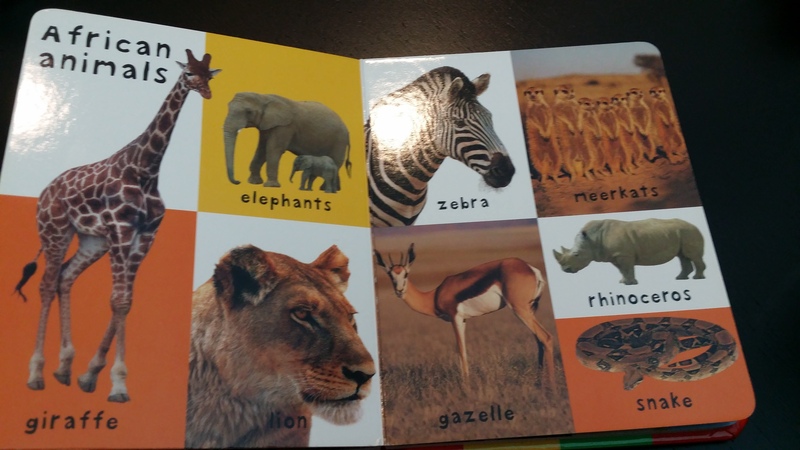 He is still learning words with two different syllabus so at the moment, giraffes are just “raffes”. He can recognise a number of animals quite easily, without having seen them in real life before. I am not sure if it is because we were animated when describing the animals to him, but to encourage him and his love for animals, we went to the library recently to borrow many animal books with actual pictures and read them to him. He loves to point out the different animals and names them as he points them out. 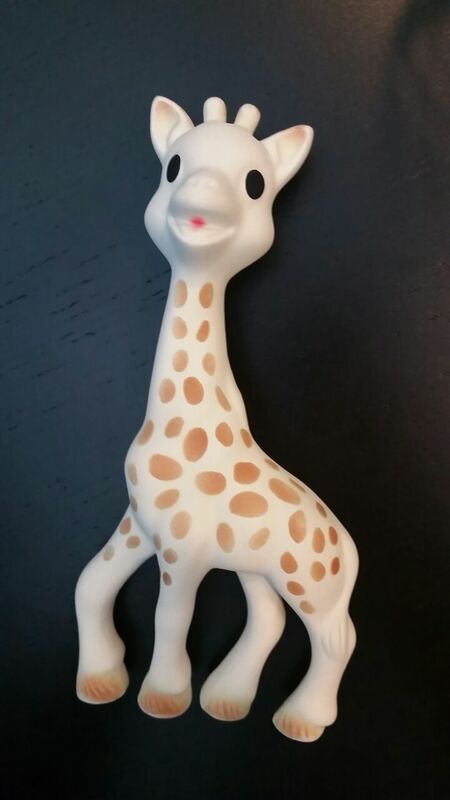 He also has a teether for him to chew on when he is teething in the form of a giraffe which he fondly calls “Raffe” and a stuffed monkey he loves to hug at night which he fondly calls “Key”. While Riley may be too young to understanding all his experiences, we can certainly add provide him with more experiences. 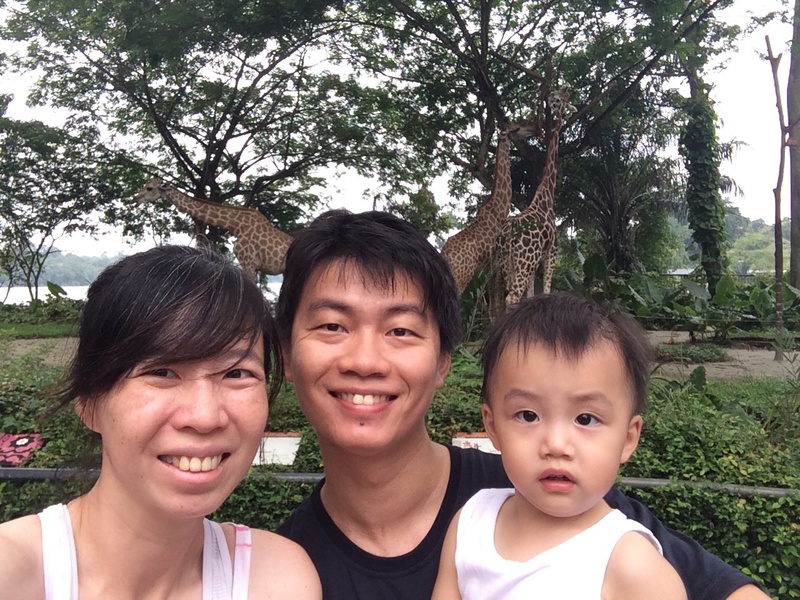 Today we brought Riley to the Singapore Zoo. We brought along his animal book, so that he can make references to them. 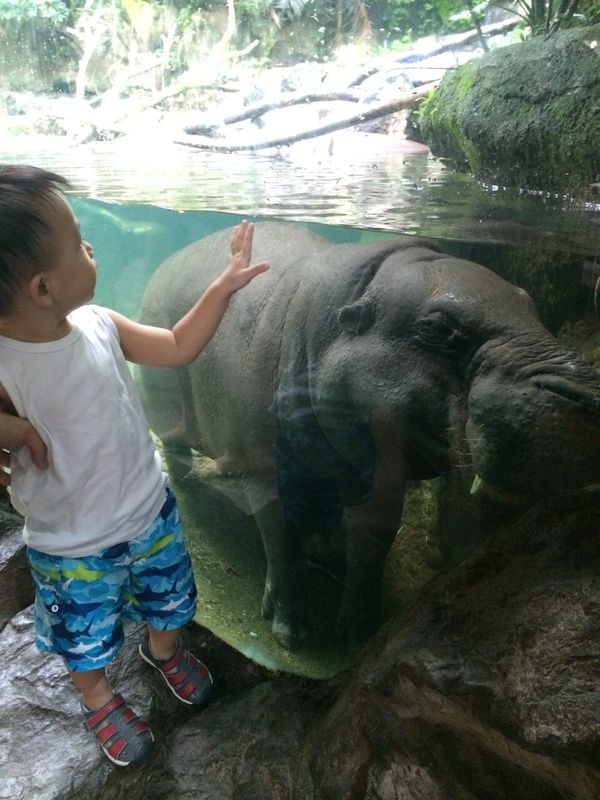 We saw the hippo. (“Po” in Riley’s words) He was prancing up and down before he fell asleep in the corner of his enclosure. Two young rhinos we playing and nudging each other with their horns. The white tiger (“Tiger!” exclaimed Riley) was taking a morning swim. He has a pool within his enclosure. The meerkats were rolling around while one of them stood watch as a sentry. The zebras (Riley’s “Bra-bra”s)were…..well, they were not doing anything, just eating. When we arrived at the giraffes, Riley was amazed. His eyes trailed the giraffes from head to toe and he was going “Woooaah”. He understood at that moment what “tall” meant. But he had no idea what we had in store for him. We intended for him to have the opportunity to feed the giraffes face to face! Suddenly, the giraffes were no longer tall. In fact, the giraffe were huge and scary. She was sticking her head right at Riley, zooming in on the snack. Riley looked a little fearful but I guided him to feed the first vegetable. I wanted to see if he was brave enough to feed the second. Riley held on to the second piece and extended his hand a little. The giraffe’s tongue snaked towards Riley’s little hand and her mouth engulfed Riley’s little hand. But the giraffe was an expert at snacking and Riley’s hand was not harmed. Well accustomed, the giraffe greedily snatched the 5 titbits away, knowing that the next child will have another 5. But for that brief one minute in Riley’s life, giraffes were big, wide mouthed, snaky tongued creatures that snatched all his food away. Learning is one of the oldest puzzles of mankind. In each era, we try to decode it, we try to simplify it into patterns, and we try to understand it with all kinds of concepts and theories. But it continues to elude us. As parents, the best learning we can provide our child, is to spend quality time with them, be examples of lifelong learners by picking up new skills together with our children or exploring new places for new experiences with our children. In this case, by bringing him to the zoo, it made the pictures in his books come to life. It was experiential learning. Yes, to come up with new experiences and our own parental curriculum and spending quality time with our kids, it is tiring. A Saturday could be easier spent relaxing and lazing around at home. But that will be wasting the future of our children and not investing in it.